GRAND RAPIDS, MI. A thin streak of yellow chalk maps an uneven path across the charcoal-gray walls of a darkened gallery room within the Urban Institute for Contemporary Art. It recalls a road, the course of a life; the nonlinear, unpredictable journey we are all fated to experience. UICA, 2014. 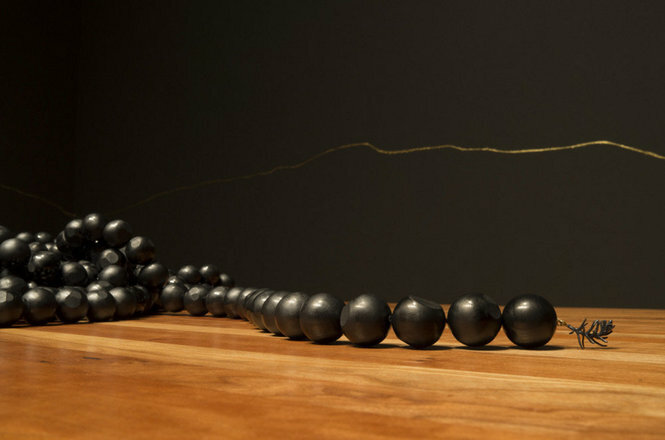 Caroline Gore, …Mercurial Silence…, installation view. That the backdrop of the space lends itself to existential musings is striking, because the exhibition displayed in and around it, …Mercurial Silence… carries the affect of death more than life. And yet it would be impossible to examine one without the other, just as experiencing deep joy often brings a sudden pang of sorrow at the thought of its loss. In this exhibition, Caroline Gore investigates the ways in which grief and loss are expressed in society, questioning the desire to memorialize tragedy with things rather than cope through human connection. Through the presentation of familiar and curious objects alike, the Kalamazoo-based artist and metalsmith conjures up an array of terms: domestic, adorned, weight, liturgical, humanistic, ghostly, cold. 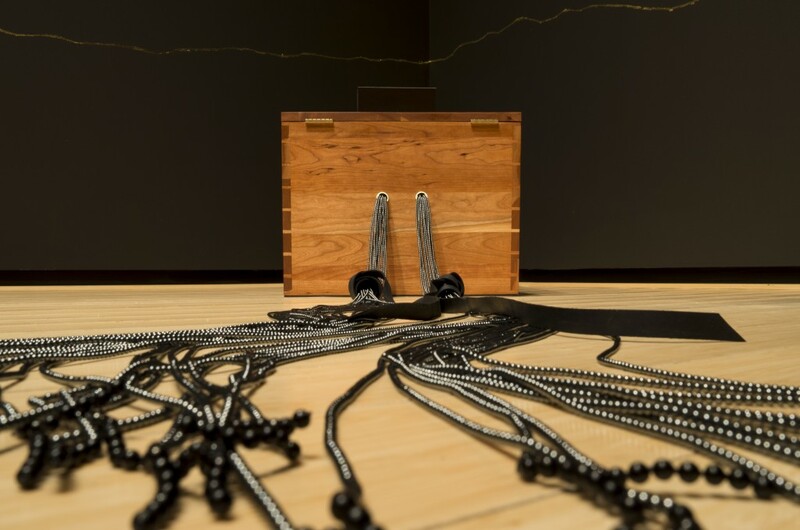 An oxidized sculpture of silver coils threaded together rests atop a wooden table; these same coils, woven around a human head, frame a diminutive portrait in gold and black. Close by, a series of ambrotypes shows seven dresses twisted, wind-blown, in seven unique configurations. As the viewer, one is led to think of the history of these objects, and our present experience of them: in what ways has the object Gore works with taken on new meaning? When we codify it as a memorial, constructing it as a reminder of something (or someone) lost, or when it extends beyond the personal, and is viewed collectively as art? The materials Gore employs in her work are significant to her explorations, and to our reception. In the installation revenir, for Niobe, strips of black leather wrap around thin brass chains evoking strands of hair, a whip, a rope. Jutting out from the gallery walls, we see curving wooden chair legs – brass spikes on the end of each one transform these recognizable forms into threatening, anthropomorphic entities. Throughout the exhibition, it is difficult to get close, both figuratively and physically, to the objects on view. Gore’s work seems to assert: things cannot heal our wounds, or replace what has been lost. In other spaces of the UICA, several works on paper by Gore are displayed. In enveloper (above), tiny burn marks scatter downwards, delicate beads on a long necklace, a rain of dots staining an otherwise white sheet of paper. Its counterpart, enveloper (below), is an imperfect reversal – showing dark brown marks shooting up into the air, recalling fireworks, seeds, tadpoles, growth. The psychological associations we might extract from the works are infinite – like a Rorschach test to which each viewer submits. The dissonant mood we uncover and grapple with throughout …Mercurial Silence…is itself a paradox, of quiet stillness and intense energy. We become at once witnesses to our own silence and active participants in a quest to understand Gore’s works. In them, we encounter the weight of memory, although these memories are not ours to own. We are compelled to interpret familiar objects with new eyes, and to question our own past responses to loss, whether we have dealt with death in life through commodity, or communion. …Mercurial Silence… at the UICA runs through April 27, 2014. April 17, 2014 | Filed under Art Seen: National and tagged with Alexandra Kadlec, Caroline Gore, UICA.